Adult Description: The adult male Florida bark scorpion (Centruroides gracilis) is large, measuring 50-153mm compared to the adult female C. gracilis which ranges from 60-100mm in length. Color can vary in this species and a female can give birth to scorplings of varying colors that differ from either parent. The Florida bark scorpion can be red, black, or contain bands and markings that are red, yellow, brown, black, or orange in color. Larva Description: Newborn (nymphs) are small and pale at birth, but begin taking on adult characteristics after the first molt. Males and females mature at different rates. The female nymph reaches maturity after the 7th instar while the male is mature at the onset of the 6th instar. 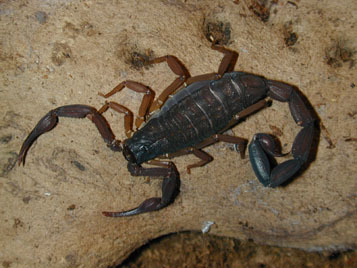 Ecological Threat: Centruroides gracilis is venomous, but is not considered dangerous or deadly. As a result minimal research has been conducted on this species. However, it is still considered a threat to safety because it is venomous and will take up residence in homes. Biology: The gestation period for this species varies from several months to over a year. Females give birth to 25-35 young. After birth, the young climb and attach to the mothers back where they remain until the first molt (about one week). After the first molt, they become independent of the mother, and molt 5-7 additional times before reaching maturity. History: It is thought that this species was introduced from the tropics by boat. U.S. Habitat: In the tropics (where native) this species is found in tropical forests hiding under rocks and bark. In the United States (where introduced) C. gracilis can be found hiding under stones, or wood piles, and inside or outside buildings and houses. U.S. Present: Currently C. gracilis can found in southern states where the climate remains tropical for most of the year. Centruroides gracilis should be handled with care if found. This species survives well in captivity and is a common aquarium pet. Pesticides are available and the most effective method of control. Francke, O. and S. Jones. 1982. The life history of Centruroides gracilis (Scorpiones, Buthidae). Journal of Arachnology, 10: 223-239. Sissom, W. D., & Lourenço, W. R. 1987. The genus Centruroides in South America (Scorpiones, Buthidae). Journal of Arachnology, 11-28. © 2014 Texas Invasive Species Institute. All Rights Reserved.